Report on the 8th annual Pinot Days San Francisco Grand Festival Tasting, on Saturday June 16th, 2012, at Fort Mason in San Francisco. The event focuses on current releases of Pinot Noir from producers in California and around the world. 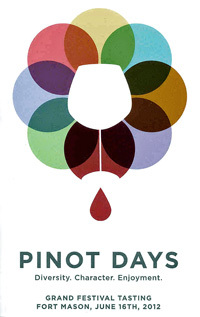 Pinot Days includes a number of events leading up the Grand Festival Tasting. In the week before that Saturday, there were five focused tastings at a number of Bay Area wine shops and wine bars, and a winemaker dinner at Dixie Restaurant in San Francisco (presented in conjunction with the American Institute of Wine and Food). There was also a VIP “Depth and Diversity Tasting” at Fort Mason before the Grand Festival Tasting. This was the second year of Pinot Days’ online auction – with lots featuring fine wines, wine tastings, tours, and other Pinot-related items. Part of the auction proceeds this year benefit the IOCC Emergency Relief Kit Program. 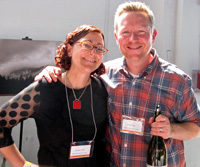 Over 150 individual producers and trade groups from overseas were represented at this year’s Pinot Days event. Most wineries were from California – from nearly every Pinot region in the state – and there were also a number of Oregon wineries and small contingents from Burgundy, Germany, and New Zealand. In addition to the wide variety of Pinot Noirs and some Pinot-based Rosés and sparklers, there were a few non-Pinot wines on hand, which actually proved a nice change of pace. I managed to attend a couple of the smaller Pinot Days “Kick-off” tastings in the days leading up to the Grand Festival Tasting. Late afternoon on Thursday I was at the Vine at Bridges in Danville, where August West, Cargasacchi, Derby, and Poe poured their wines (I helped pour the August West wines there). Then on Friday I stopped by K&L Wine Merchants in San Francisco, where Cargasacchi was again pouring, this time with Le Cadeau, Romililly, and Waits-Mast. Attendance at both of these events seemed very good – I was certainly kept busy pouring on Thursday. I didn’t take notes at either of these tastings, so all of the notes here are from the Saturday Grand Festival Tasting. Pinot Days has long impressed me with how well-organized their event is in comparison to some other large wine tastings, and this year ran more smoothly than ever. Check-in was a breeze, and it was easy to navigate through the large Festival Pavilion to find specific tables I was looking for. Overall, the event seemed a bit less crowded this year as in some past years, both in terms of the number of wineries participating and in the public attendance. That’s not too surprising given the continued economic slump – particularly in California – and I hope that things improve in the coming years. A few tables were packed with tasters but most were not too tough to approach. As was the case last year, the Oregon producers were grouped in a separate area, making it easy to check out their wines. Pinot Days differs from other large wine tastings I’ve attended in that it’s clearly all about the wine. There were few food purveyors at the event, and although the empanadas from El Porteno in San Francisco smelled tempting, I kept focused on the wine. 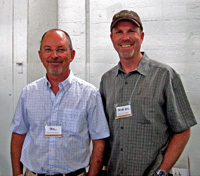 I was joined at the Pinot Days Grand Festival Tasting by Grape-Nutz colleague Al Osterheld. Due to the time limitations of the tasting, we passed on a number of very good wineries, particularly ones whose wines I’ve tasted within the past 4-5 months or hope to taste within the next couple of months. These wineries included Alma Rosa, Alta Maria, Benovia, Cartograph, Chanin, Dragonette, Dutton-Goldfield, Failla, Foursight, Foxen, Freeman, Grey Stack, Kendric, Native9, and Sojourn. And of course there were still a number of other winery tables I would have liked to visit but just didn’t have time to do so. Still, I felt that Al and I managed to sample wines from a good cross-section of producers at the tasting. The wines we tasted were nearly all either current releases or wines that will be released later this year. As usual with larger events such as this, there were a few wines that had also been poured last year as well. About half of the Pinots we sampled were from the 2009 vintage, with the rest nearly evenly split between 2010 releases and 2008 and older wines. I felt the 2009 wines in general have benefited from the additional year of bottle age in comparison to how many of them showed last year. Not surprisingly, the 2010s were split between those showing quite well in their youth and those that clearly need more time to develop. From our relatively small sampling, I think the 2010 Pinot vintage in California will be a very good one, though perhaps not up to the level of 2009. As noted above, Pinots from California dominated the tasting. 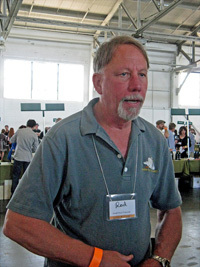 Other than a few Oregon wines, Al and I did not taste Pinots from elsewhere this year. The limited representation of wines from these other areas made me feel that my time might not be well-spent at those tables, whether or not that would actually have been the case. In any event, we stuck mainly to California Pinots, and tried to taste wines from a number of different AVAs along the way. As opposed to last year’s tasting, where I found most of my favorites came from just a few growing areas, this year’s favorites were spread more evenly among a range of appellations. As I did last year, I limited the wines on the list to no more than one per producer, though several of the wineries that had particularly strong showings – Arista, August West, Baxter, Couloir, Ladd, and Scherrer among them – could have had more than one listed. And as usual, there were a handful of wines that just missed the favorites list but were strong contenders nonetheless. Pinot Days seeks to celebrate the diversity of Pinot Noir – “one grape, so many styles.” As I’ve found before at this event, it does a fine job of showcasing the great variety of Pinots available. For Pinot-lovers, there are few other opportunities that can compete with Pinot Days as a way to taste old favorites, try promising newcomers, and get a good feel for the current state of this noble grape and its vintners. 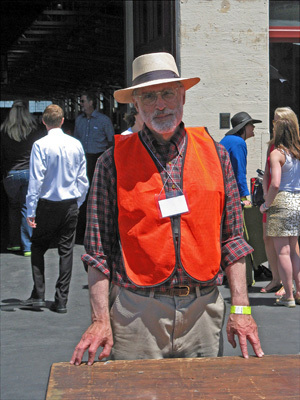 I’m looking forward to attending Pinot Days again next year. Arista 2010 Pinot Noir, Ferrington Vineyard, Anderson Valley. Medium color, this displayed floral red fruit, earth, forest floor, and undertones of spicy oak. Medium-bodied and lively on the palate, with fairly mild tannins on the finish, nice. Arista 2010 Pinot Noir, Mononi Vineyard, Russian River Valley. Medium color, more fruit-forward than the Ferrington with black cherry and plum, spice, and a touch of vanilla/oak on the nose. Bigger body than the Ferrington with a moderately tannic finish. Arista 2010 Pinot Noir, Toboni Vineyard, Russian River Valley. Medium ruby color, featuring darker berry fruit, earth, mushrooms, and spice aromas. Big and structured, this needs time to settle down but has very good potential. Comments: Arista presented a strong trio of wines. All of these will benefit from time in the cellar. August West 2009 Pinot Noir, Graham Family Vineyard, Russian River Valley. Medium-light color, with ripe red cherry, earth, and spice aromas. Medium weight in the mouth with a fairly round texture and smooth finish. August West 2010 Pinot Noir, Graham Family Vineyard, Russian River Valley. Medium-light color, red fruit, cola, and spice with a touch of pepper. Showing more acidity and structure than the 2009, with a mild tannic bite on the long and tasty finish. August West 2009 Pinot Noir, Rosella’s Vineyard, Santa Lucia Highlands. Medium-light color, featuring ripe black cherry and lots of spice. Medium-bodied with good acidity and lingering finish. August West 2010 Pinot Noir, Rosella’s Vineyard, Santa Lucia Highlands. Medium-light color, this was a bit tighter than the 2009, but displayed brighter red fruit and a bit less spice on the nose. Very lively acidity on the palate, with a bit more tannin on the finish that a year or two of bottle age should help smooth out, nice. Bailiwick 2009 Pinot Noir, “Borderline,” Marin County. Lighter color, with delicate red fruit, earth, dried herbs, and a bit of oak/spice. Medium-bodied and lively, this had some mild tannins on the spicy finish. Bailiwick 2009 Pinot Noir, Silver Pines Vineyard, Sonoma Mountain. From a vineyard at 900-foot elevation with volcanic soil, 115 clone. Featuring bright black cherry and a bigger earth component than the Marin bottling, this also showed some forest floor notes and a touch of spice. Bigger and more structured, this finished with a moderate tannic grip. Should develop very nicely with some bottle age. Bailiwick 2009 Pinot Noir, Russian River Valley. Medium-light color, with red cherry, pepper, and spice on the nose. Bright and lively mouthfeel, this also showed the structure for some cellar time. Comments: Brothers Bryan and Paul Vais poured their wines. The 2009 vintage was their first, and they’re off to a good start with these wines. Baxter 2010 Rosé, Mendocino County. Light salmon/pink, with strawberry and earth aromas. Medium-light weight with a fairly smooth texture and finish. showing ripe black cherry, earth, and tea leaf notes. Medium-light weight on the palate with milder tannins. Baxter 2009 Pinot Noir, Langly Vineyard, Anderson Valley. From Martini clone. Medium color, this displayed black cherry and plum fruit, along with bigger earth, mushroom, and spice components. Medium-bodied and lively, with a bit more tannic grip on the finish, nice. Baxter 2009 Pinot Noir, Oppenlander Vineyard, Mendocino County. About 50% Pommard clone and 50% 114 and 115 clones. Medium color, this was less fruit-forward, featuring brushy, spicy, and minerally notes along with a darker fruit profile. Bigger structure than the previous wines, this will need some time in the cellar. Distinctive and very nice. Baxter 2009 Pinot Noir, Run Dog Vineyard, Anderson Valley. Slightly darker color, more intense black cherry fruit along with earth and forest floor on the nose. More full-bodied on the palate, with a grippy finish. Comments: This was my first experience with this winery, and Phillip Baxter poured a solid line-up of wines. Point Concepción 2009 Pinot Noir, “Salsipuedes,” Santa Barbara County. Mostly 114 and 115 clones plus Mt. Eden selection from Cargasacchi-Jalama Vineyard. Medium-light color, with ripe red berry fruit, spice, and tea leaf scents. Medium-bodied, this had a fairly smooth texture with milder tannins. A good value-priced Pinot. Cargasacchi 2009 Pinot Noir, Cargasacchi-Jalama Vineyard, Santa Barbara County. From 828 clone – though Peter Cargasacchi suspects that’s not what it really is. Medium ruby color, this displayed black cherry and raspberry fruit, spice, and an herbal note. Bigger-bodied than the first wine, with a fairly bright mouthfeel and finish. Cargasacchi 2009 Pinot Noir, Cargasacchi Vineyard, Sta. Rita Hills. 100% Clone 115. Medium color, showing plum and darker berry fruit, earth, spice, and dried herbs. Medium-full bodied but with a lively texture and good acidity, this had moderate tannins on the long finish, nice. Point Concepción 2009 Pinot Grigio, “Celestina,” Sierra Madre Vineyard, Santa Maria Valley. Medium-light orange/salmon color, featuring apple and pear aromas along with lots of spice. Medium weight on the palate with refreshing acidity, and lively finish, nice. Comments: Grower/winemaker Peter Cargasacchi was behind the table. All three of his Pinots were very distinct from each other, and the Pinot Grigio, cold-soaked on its skins, was very pleasant. Clos Pepe 2009 Brut Rosé, Estate, Sta. Rita Hills. Light color, with a yeasty nose along with bright apple, a touch of strawberry/cranberry, and spice. Light and lively, with a crisp finish. Clos Pepe 2007 Pinot Noir, Estate, Sta. Rita Hills. Medium-light color, with brighter red fruits, earth, and spice. Medium-lighter bodied, with a fairly smooth texture but retaining good acidity on the finish. Clos Pepe 2008 Pinot Noir, Estate, Sta. Rita Hills. Medium-light color, more shy aromatics of earth, cherry, and tea leaf. Showing a bigger structure than the 2007, with more grip on the finish. Clos Pepe 2009 Pinot Noir, Estate, Sta. Rita Hills. Medium-light color, this displayed more intense aromas of black cherry, herbs, earth, and a floral note. Nice texture on the palate with fairly refined tannins, nice. Clos Pepe 2010 Pinot Noir, Estate, Sta. Rita Hills. Medium color, with riper and more upfront plum and darker fruit and spice. Medium-bodied and still showing fairly primary, this needs time to fully integrate and show its best. Comments: Winemaker Wes Hagen always pours a vertical of his Pinots and it’s great to be able to taste how the wines have developed. The new sparkling wine was very nice as well. Straight Line 2010 Pinot Noir, Mendocino County. Sourced from five vineyards, about 40% whole-cluster fermentation. Medium-light color, featuring herbal red fruits, spice, and an earthy note. Medium-bodied, this is drinkable now but has the structure for some further bottle age. Couloir 2010 Pinot Noir, Londer Vineyard, Anderson Valley. Mostly Pommard and 115 clones, about 40% whole-cluster fermentation. Medium-light color, with floral scents along with black cherry and plum, spice, and tea leaf notes. More weight on the palate than the Straight Line, with a more tannic finish, nice. Couloir 2010 Pinot Noir, Oppenlander Vineyard, Mendocino County. About 80% Pommard clone and 20% 115, with 50% whole-cluster fermentation. Medium color, this was less fruit-forward, emphasizing earthy, forest floor, and black pepper with darker berry fruit in support, plus a hint of flowers. Bigger structure, with firm acidity and tannins. An intriguing wine that should improve with time in the cellar. Couloir 2010 Pinot Noir, Roma’s Vineyard, Anderson Valley. From an 1,800-foot elevation vineyard, about 60% whole-cluster fermentation. Medium color, with more upfront black cherry fruit, baking spices, and dried herbs on the nose. Richer mouthfeel but with good acidity and a somewhat grippy finish. Couloir 2010 Pinot Noir, Monument Tree Vineyard, Anderson Valley. From 115, 667, and 777 clones, about 50% whole-cluster fermentation. Medium color, more intense cherry and raspberry aromas along with spices, tea leaf, and a touch of sweet oak. Big and structured, this will need more age to show its best. Comments: Couloir also makes a very good Marin County Pinot, which I tasted at another recent event. 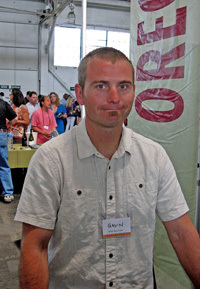 Vintner Jon Grant presented a solid line-up of wines, which are fermented using 40-60% whole clusters. These will all benefit from more bottle age. Derby 2007 Pinot Noir Méthode Champenoise, Derbyshire Vineyard, San Simeon, San Luis Obispo County. 100% Pinot Noir from 115, 667, and 777 clones. Light salmon/pink color, light scents of red fruits, toast, and herbs. Bright feel on the palate, with a lighter-bodied style. Derby 2009 Pinot Gris, Derbyshire Vineyard, San Simeon, San Luis Obispo County. Aged in stainless steel and neutral oak. Light straw color, this displayed pear, a bit of citrus, and spice aromas. Bright mouthfeel and crisp finish, nice. Derby 2007 Pinot Noir, “Reserve,” Derbyshire Vineyard, San Simeon, San Luis Obispo County. From 115, 667, and 777 clones, aged in 80% new French oak. Medium-light color, with dried herbs and baking spices leading the way along with cherry and cranberry fruit, with an underlay of vanilla/oak. Medium-bodied with moderate tannins on the finish. Derby 2009 Pinot Noir, Derbyshire Vineyard, San Simeon, San Luis Obispo County. From 115, 667, and 777 clones, 10% whole-cluster fermentation, aged in 21% new French oak. Medium color, featuring ripe black cherry and plum, plus bigger components of spice and sweet oak. Moderately rich mouthfeel but with a lively finish, this should improve with some time in the cellar. Comments: Derbyshire vineyard is just a mile from the Pacific Ocean near San Simeon, and the wines always show bright acidity. The 2009 was my favorite of the two Pinot Noirs. Inman 2010 “Endless Crush” Rosé of Pinot Noir, “OGV,” Russian River Valley. Light salmon color, with bright strawberry fruit and spice on the nose. Vibrant mouthfeel and a clean finish, nice. Inman 2008 Pinot Noir, Thorn Ridge Ranch, Russian River Valley. Medium color, this showed intense cherry and raspberry fruit, along with touches of spice, herbs, and smoke. Medium-bodied with a lively texture and finish. Inman 2008 Pinot Noir, “OGV,” Russian River Valley. Medium color, displaying more complex aromas of earth, cranberry and cherry, spice, and minerals. Moderately rich but with a bigger structure than the Thorn Ridge bottling and a grippier tannic finish, nice. Comments: Kathleen and Simon Inman were behind the table for this event. Their “Endless Crush” Rosé is produced only in even-numbered years, with fruit specially picked for this bottling, then destemmed and pressed. The Pinots tend to take some time to develop, and the 2008 “OGV” was showing quite well. Joseph Phelps 2009 Chardonnay, Freestone Vineyards, Sonoma Coast. This went through full malolactic fermentation. Light color, with red apple, baking spices, and a touch of citrus on the nose. Medium weight on the palate with a fairly smooth texture and finish. Joseph Phelps 2009 Pinot Noir, Freestone Vineyards, Sonoma Coast. About 10-15% whole-cluster fermentation. Medium color, this displayed bright cherry, earth, and mineral aromas. Very good structure with a vibrant mouthfeel and a mildly grippy finish, very nice wine that should be age-worthy. Comments: These wines were previously under the separate Freestone Vineyards label, but they’re now labeled as Joseph Phelps – they developed and own the vineyards, located in the cooler region of the western Sonoma Coast. Both of these wines were very good. Joseph Swan 2010 Pinot Noir, “Cuvée de Trois,” Russian River Valley. Lighter color, displaying bright cherry fruit plus earth and a touch of spice. Fairly straightforward wine with a slightly tangy finish. Joseph Swan 2008 Pinot Noir, Saralee’s Vineyard, Russian River Valley. Light color, this featured earthier black cherry, spice, and some funk on the nose. Medium-bodied with a smoother texture and finish. Joseph Swan 2008 Pinot Noir, Trenton View Vineyard, Russian River Valley. Medium-light color, with bright, higher-toned aromas of cherry, spice, and smoke. Bigger body and structure than the first two wines, this had a more tannic and slightly smoky finish. Joseph Swan 2009 Pinot Noir, Trenton Estate Vineyard, Russian River Valley. Medium-light color, this showed more intense black cherry, earth, and tea leaf notes. Bigger and more structured, this had a lively finish with tannins that suggest cellar time will be of benefit, nice wine. Joseph Swan 2009 Pinot Noir, Great Oak Vineyard, Russian River Valley. From a vineyard farther west along River Road. Slightly darker color, this had a darker fruit profile along with earth and spice components. More full-bodied and considerably more tannic than the other wines. Comments: Winemaker Rod Berglund poured his Pinots at the event. All were quite distinct from each other, with the Trenton Estate being my favorite. Keefer Ranch 2010 Pinot Noir, Russian River Valley. From Swan and 115 clones, 100% destemmed, about 40% new oak, bottled about 10 weeks prior to the tasting. Medium color, featuring bright black cherry, cola, black pepper, and spice on the nose. Medium-bodied with good structure, this had a lively finish with moderate, refined tannins, quite nice. Comments: Marcy Keefer and Craig Strehlow were behind the table, and their wine was one of the standouts of the tasting. Ladd 2009 Pinot Noir, Sonoma Coast. Light garnet color, this showed bright red fruit, earth, and tea leaf aromas along with a touch of spice. Medium-light bodied, this was lively and pleasant, nice. Ladd 2009 Pinot Noir, Russian River Valley. Medium-light color, with black cherry, spice, and a mineral note. Medium weight on the palate, with a bit smoother texture than the Sonoma Coast bottling. Ladd 2009 Pinot Noir, Anderson Valley. Lighter color, this was less fruit-forward, displaying more earth and herb plus cherry and cranberry fruit. More structured than the first two wines, with a grippier finish. Ladd 2009 Pinot Noir, “Cuvée Abigail,” Sonoma Coast. Medium-light color, with a more spicy aroma along with black cherry and raspberry, pepper, and earth. Bigger structure than the regular Sonoma Coast bottling, with noticeable tannins on the lively finish, nice. Ladd 2008 Pinot Noir, Moore Ranch, Russian River Valley. Slightly darker color, with more upfront black cherry and plum on the nose along with earth and baking spice. A bit richer mouthfeel with good acidity and moderate tannins on the finish. Le Cadeau 2009 Pinot Noir, “Côte Est,” Oregon. Medium-light color, fairly fruit-forward with black cherry and raspberry fruit, with earth and spice notes in support. Medium-light bodied with a smoother texture and finish. Le Cadeau 2009 Pinot Noir, “Diversité,” Willamette Valley. Medium color, with less upfront red and black fruits, plus forest floor and lots of spice. More structured on the palate, with more noticeable grip on the finish, nice. Le Cadeau 2009 Pinot Noir, “Côte Est Reserve,” Oregon. Medium color, showing earth and herbs along with plummy fruit and a touch of vanilla/oak. Bigger and richer in the mouth, with the viscosity helping to hide the tannins on the finish. Aubichon 2008 Pinot Noir, “Reserve,” Willamette Valley. About 50% estate fruit. Medium ruby color, this displayed riper black cherry fruit, earth, spice and a bigger oak component. Moderately rich mouthfeel, with the sweet oak coming through again on the finish. Comments: The fruit for Tom and Deb Mortimer’s Le Cadeau wines all comes from their estate vineyard in the Chehalem Mountains AVA. 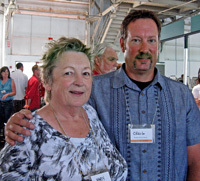 Each cuvée is made by a different winemaker.Aubichon Cellars is a related label, co-owned by Tom Mortimer. Loring 2010 Pinot Noir, Clos Pepe Vineyard, Sta. Rita Hills. Medium color, with ripe darker berry fruit, earth, and dried herb aromas. Medium-bodied and fairly structured, with a moderately tannic finish. Loring 2010 Pinot Noir, Rancho La Viña, Sta. Rita Hills. Slightly darker color, this featured ripe black cherry, spice, and earth notes. Bolder, richer mouthfeel, finishing with refined tannins. 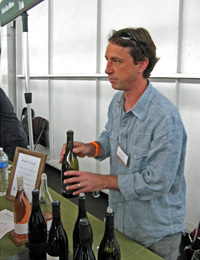 Comments: Peter Cargasacchi did double-duty at the tasting and poured the Loring wines in addition to his own. Mahoney 2009 Pinot Noir, Carneros. Sourced from the Las Brisas and Mahoney Ranch vineyards. Lighter color, with earthy strawberry and cherry fruit and herbs. Medium-light bodied, this finished with mild tannins. Mahoney 2009 Pinot Noir, Haire Vineyard, Carneros. From UCD 16 Jackson clone. Medium-light color, displaying a more spicy character along with black cherry and raspberry, plus earth and a touch of oak spice. More weight on the palate than the previous wine, with a moderately tannic finish. Mahoney 2009 Pinot Noir, Las Brisas Vineyard, Carneros. Medium-light color, this was earthy and herbal, with red fruits and vanilla/oak in support. More structured in the mouth with fairly grippy tannins. Mahoney 2009 Pinot Noir, Mahoney Ranch, Carneros. From Swan, 23, UCD 107, and 667 clones. Medium-light color, another earthy and herbal wine, with darker fruit notes along with tea leaf and spice on the nose. Big, structured, and tannic, this shows promise but will need time to evolve in the bottle. Comments: Francis Mahoney (of Carneros Creek fame) owns and farms both the Las Brisas and Mahoney Ranch vineyards, located at opposite ends of the Carneros AVA. Poe 2010 Pinot Noir, Angel Camp Vineyard, Anderson Valley. The vineyard is near the “Deep End” of Anderson Valley, closest to the coast. Medium ruby color, with ripe black cherry, earth, spice, and a touch of oak. Big and structured, this finished with grippy, youthful tannins that will need time to smooth out. Poe 2010 Chardonnay, Ferrington Vineyard, Anderson Valley. About 80% malolactic fermentation. Light straw color, with bright apple, lees, and spice aromas. Medium-bodied with vibrant acidity and crisp finish, quite nice. Comments: Poe was a new producer to me this year, and owner Samantha Sheehan was pouring her wines. The Pinot was promising though quite young, while the Chardonnay was extremely good. Scherrer 2011 Dry Rosé, Sonoma County. Over the past few years, Scherrer Rosés have moved from Pinot and Zin to Syrah and Grenache – the 2011 was about 70% Syrah and 30% Grenache, whole-cluster pressed. Light salmon/orange color, with grapefruit and spice on the nose, and a bright mouthfeel and finish. Scherrer 2008 Pinot Noir, Sonoma County. Medium-light color, displaying black cherry and earth aromas, along with an herbal note. Medium weight on the palate, with mild tannins and a spicy finish. Scherrer 2009 Pinot Noir, Sonoma County. Similar color to the 2008, this was less fruit-forward, with earthy red fruits, forest floor, and a minerally component. More structured than the 2008, showing fine acidity and a moderate tannic grip, nice. Scherrer 2008 Pinot Noir, Russian River Valley. Medium-light ruby color, with more intense cherry fruit, plus spice and slightly floral aromas. Richer mouthfeel with a lively texture and finish. Scherrer 2009 Pinot Noir, Russian River Valley. Medium-light color, brighter red fruits, baking spices, and a touch of orangepeel. More structured than the 2008, with more noticeably acidity and tannin, nice. Scherrer 2008 Pinot Noir, Platt Vineyard, Sonoma Coast. Slightly darker color, this showed more spice and forest floor aromas along with black cherry fruit. Medium-bodied with a lively mouthfeel and moderate tannins. Scherrer 2006 Pinot Noir, Hallberg Vineyard, Green Valley of Russian River Valley. Medium color, with bright, higher-toned red fruit, tea leaf, and black pepper on the nose. Weightier on the palate with fairly firm tannins. Scherrer 2007 Pinot Noir, Hallberg Vineyard, Green Valley of Russian River Valley. Medium color, riper red berry fruit with more spice and an earthy note. Bigger structure and more tannic finish than the 2006. Comments: As was the case last year, the Scherrer wines were impressive. Mainly “mid-sized” Pinots, these displayed very good distinctiveness between the various wines. Thomas Fogarty 2010 Pinot Noir, Windy Hill Vineyard, Estate, Santa Cruz Mountains. From vines planted in 1983, 100% whole-cluster fermentation. Medium color, with herbal/stemmy aromas upfront, followed by bright red fruit, earth, and an underlay of oak. Lively mouthfeel with a fairly firm tannic finish. Thomas Fogarty 2010 Pinot Noir, Rapley Trail Vineyard, Estate, Santa Cruz Mountains. From a vineyard planted in 1981. Medium color, this showed deeper fruit on the nose, along with herbs, earth, and lots of spice. A bit richer in the mouth than the Windy Hill, with a moderately grippy finish, nice. Comments: These seemed to be fewer Santa Cruz Mountains Pinots at the event this year. This is the second straight year that the Thomas Fogarty Rapley Trail Pinot has impressed me. Waits-Mast 2010 Pinot Noir, Londer Vineyard, Anderson Valley. About 50% each 115 and Swan clones. Medium-light color, featuring black cherry, earth, and dried herb aromas. Medium-bodied with good acidity and moderate tannins. Waits-Mast 2009 Pinot Noir, Amber Ridge Vineyard, Russian River Valley. From 115, 667, and 777 clones. Medium color, with riper plum, spice, and an undercurrent of oak. Bigger and richer on the palate, with noticeable but fairly refined tannins. Waits-Mast 2009 Pinot Noir, La Encantada Vineyard, Sta. Rita Hills. 115 and 777 clones from the organic vineyard planted by Richard Sanford. Medium color, this showed darker berry fruit, earth, and some sweet oak. Medium weight but with more pronounced acidity than the Amber Ridge, leading to a grippier finish. Waits-Mast 2009 Pinot Noir, Deer Meadows Vineyard, Anderson Valley. From 115 and Wädenswil clones from the old Savoy One Acre site. Medium ruby color, displaying pretty floral aromas along with bright red fruits, herbs, and spices. Big and structured, this will take time to come into its own, but has great promise, very nice. Comments: Another new winery to me, Jennifer Waits & Brian Mast presented a solid group of wines, with the Deer Meadows bottling being a particular standout. White Rose 2009 Pinot Noir, Willamette Valley. From six Pinot clones, 20% whole-cluster fermentation, about 13% new oak. Medium-light color, this showed lots of herbal aromas along with bright cherry fruit, earth, and spice. Medium weight on the palate with a lively texture and finish. White Rose 2009 Pinot Noir, Dundee Hills. From 113, 114, 115, and Pommard clones, mostly from estate fruit, 40% whole-cluster fermentation, about 16% new oak. Medium-light color, featuring cherry and cranberry, tea leaf, along with floral and spice components. Bigger structure and body than the Willamette Valley bottling, with moderate tannins on the finish, nice. White Rose 2009 Pinot Noir, White Rose Vineyard, Dundee Hills. From Pommard clone vines planted in 1980, 60% whole-cluster fermentation, about 8% new oak. Medium-light color, this displayed more noticeably stemmy character than the first two wines, along with red fruits, earth, and spice. A more structured wine that will need more bottle age to show its best. Comments: This was the second straight year that I’ve found the White Rose Pinots to be very good. Winderlea 2009 Pinot Noir, Winderlea Vineyard, Dundee Hills. From Pommard, Coury, 115, 667, and 777 clones. Medium color, this displayed ripe black cherry and plum fruit, spice, and a dash of sweet oak. Medium-bodied with moderate tannins and a touch of heat on the finish. Winderlea 2010 Pinot Noir, Winderlea Vineyard, Dundee Hills. Slightly lighter color, showing red fruits, some earth and funk notes, smoke and herbs on the nose. Somewhat brighter mouthfeel with a lively finish. Winderlea 2009 Pinot Noir, “Legacy,” Winderlea Vineyard, Dundee Hills. From older vines, Pommard and Coury clones. Lighter color, with earthy and minerally aromas along with cherry, raspberry, and spice. A bit bolder on the palate, this finished with a moderate tannic grip. Comments: The Winderlea Vineyard was formerly known as Goldschmidt, and was planted in 1974. The “Legacy” bottling was my favorite of the three. Woodenhead 2008 Pinot Noir, Russian River Valley. Medium color, featuring ripe cherry and hints of black pepper, with an underlay of spicy oak. Medium-bodied and fairly rich in texture, with refined tannins on the finish. Woodenhead 2010 Pinot Noir, “Wet Kiss,” Russian River Valley. Mostly from Martini clone. Medium-light color, this showed upfront cherry, cola, spice, and a slight orangepeel note. Lighter-bodied, with moderate tannins. Woodenhead 2007 Pinot Noir, Wiley Vineyard, Anderson Valley. From 27 year-old Pommard and Mt. Eden clone vines. Medium ruby color, with a more earthy character along with plum and tea leaf notes. Bigger structure, with more prominent tannins on the finish. Comments: Nick Stez and Zina Bower poured their wines. Their new “Wet Kiss” bottling is a nice early-drinking Pinot.